I’ve been talking a lot about what you should do with your tanks, so I figured I should show you mine. Now I’m really not the greatest aquatic photographer, so please bear with me. I have very few clear pictures of my fish. I’ll start with my oldest tank. This tank has been set up for going on 6 years now. It originally housed my koi that I overwintered inside. Since I already had the filtration for them I replaced the koi with goldfish once the koi went to the pond. It currently houses my two goldfish Goldeen the red ryukin and Seaking the calico veiltail. Both are male fish, so the next goldfish I add should also be male. If I added a female she would get harassed too much during breeding activities. I would love to find a calico ryukin or black maruko (egg fish)/ranchu. Right now I have no plants in it as I am finishing up a salt treatment for a mysterious ailment that has plagued my calico goldfish for years. Seaking has had tattered fins his whole life as well as been plagued by these mysterious white spots. They are larger than ich and appear to be some kind of warty growth possibly caused by a virus. They appear and disappear on a whim and never seem to bother him. Occasionally these were accompanied by a bit of fungus and bacterial fin rot. That is why the salt is in there. When the salt is removed I’m going to try keeping hornwort and vallisneria in pots. I have also removed the heater for the summer as my tank gets about 80F (26C). For the more technical aspects I run two HOB filters, one Aquaclear 70 and a Marineland Penguin 200. Both have been running since the tank was established and both have the flow baffled to prevent them from blowing around my fancy goldfish. I have an air pump connected to a bubble wand that runs during the summer to ensure good oxygenation. The substrate is large river rock, and the lighting is 6500k 15w 12 inch T8 bulbs (x2). I have a bag of CaribSea crushed coral in the Aquaclear to raise the GH and KH to more acceptable levels for goldfish. Weekly water changes are 40% of the tank volume. 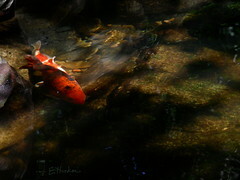 It was completed in spring of 2007 and has been stocked with koi ever since. I initially added 4 koi and added another 2 the following year to bring me to a total of 6 koi. Everyone is about 16 inches (40 cm) long and has a very healthy appetite. The pond is understocked, but I don’t plan to add any more koi. I believe one of the reasons it has succeeded (despite a pump failure one winter) is due to the light stocking. I also have a breeding colony of mosquitofish (Gambusia holbrooki) in there. The pond runs on a bog and snorkel system. Water from the pond drains into a bog (a large reservoir designed to always keep the pump underwater), and from there the pump moves it up to the top of the waterfall. Because the surface area is so large, I have an autofill system in the snorkel. This prevents the water levels from dropping too low in case of a dry spell. I have done very little with planting the pond aside from some iris that were given to me the summer my pond was completed. The iris also came with some bog plants that are now found around the edges of my pond. Due to the high surface movement I have trouble keeping floating plants like water lettuce and water hyacinth. My pond is almost completely shaded in the summer which helps keep the temperature at a more manageable level, but that means I can’t grow lilies. While this tank now has betta, it didn’t start off that way. On one trip home to take care of my goldfish tank, I noticed these odd looking fish at walmart. I researched them and found them to be brown kuhli loaches (Pangio oblonga). I was immediately smitten with them and had to have them. I picked up a 10 gal (37 L) setup from Walmart and whisked away with 5 of them. There they stayed throughout my college years. I added some live plants and bogwood as I read they liked. Through the years, I lost two. One was a different species, and I can’t remember what happened to the other. When I returned from college I play musical tanks and moved these guys to a larger setup to prepare this tank for two betta fish. Right now it houses Knucker and Lumi. Knucker is a blue halfmoon rosetail. Lumi is a white halfmoon plakat. The tank has 4 species of plants: java fern, anarcharis, anubias, and duckweed. I use a Aqueon Pro 50w heater and run a home-made bubble filter as I don’t like power filters with long-finned bettas. The light is a 6500k 15w 18 inch T8 bulb. I currently don’t fertilize the tank but plan to in the future. The substrate is plain, natural colored gravel that is aerated by a colony of Malaysian trumpet snails. I change 30% of the water weekly. I know. This isn’t much to look at now, but I’ve got big plans for it. I just need to get a steady source of income first. This tank started out as emergency housing for a pair of dojo loaches I bought to live with my goldfish. Well it turns out the dojos loaches took a liking to the goldfish’s slime coat, so the dojos had to go. They lived in the 29 gal for a few months before I found another aquarist to take them from me. I was sad to see them go, but I knew it was for the best. The tank currently houses my remaining brown kuhli loaches, a huge colony of malaysian trumpet snails, java fern, anubias, and water sprite (Ceratopteris cornuta). My future plans for it are to heavily plant it and add a school of cardinal tetra (Paracheirodon axelrodi) as well as a thicklips gourami (Trichogaster labiosa). I would also like to switch out the gravel for black sand. This will be the first change I make. The tank currently has a Penguin Biowheel 150, Aqueon Pro 150w heater, and 6500k 17w 24 inch T8 bulb. Water changes are 25% weekly due to the very light stocking levels. The breeder box is in there to keep the plants where I want them. This tank is almost a mirror of my other tank. It has all the same plants (but these are in worse condition) and the same setup, but the hood is different which means my lighting is different. It’s stronger in this tank, so I’m having an algae problem. The two betta that are in here are Orchid the red copper dragon halfmoon and Moonie the pastel butterfly superdelta. Due to my algae problem which is partially attributed to the lights and the hornwort that shed all of its needles in my tank, weekly water changes are 50%.